Our friend Tamara has now been in Madagascar with the Peace Corps for nearly a year. Her many experiences with a totally unfamiliar culture are exciting, nerve wracking, funny, and sometimes a little sad. The people and the countryside are beautiful. 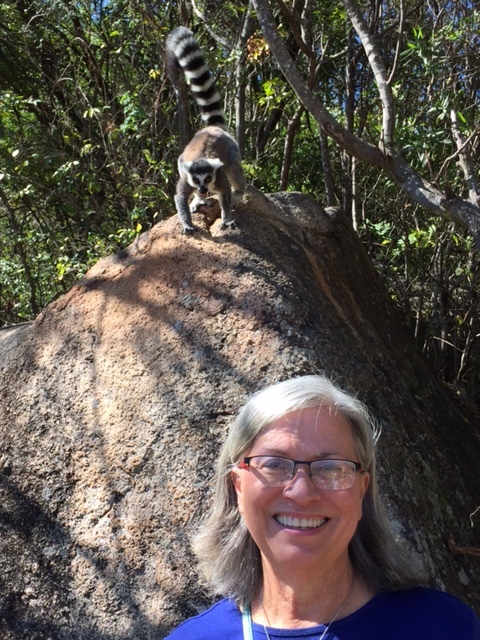 And, yes, there are wild lemurs there. In her host’s home there is electricity (one overhead lightbulb) but no running water. The only water available is brought by buckets and boiled for kitchen use, plus a bucketful a day for washing in an outdoor shower. Ironically, there is plenty of water in Madagascar, it’s just not clean water. And water treatment plants are not cheap. Neither aid money or charity can make these things happen. It will take a trustworthy government regulatory system which will encourage foreign infrastructure investment, for profit, to do so. When this happens the economy will grow and the people’s health will improve. Other countries have done this, Madagascar can too. In the meantime Tamara has meaningful work in a fascinating place where the people are friendly. Now, unfortunately, there is an outbreak of plague – we are hoping Tamara will be OK.